San Jose Water Company (SJWC) provides drinking water for over a million people in the greater San Jose Metropolitan region. 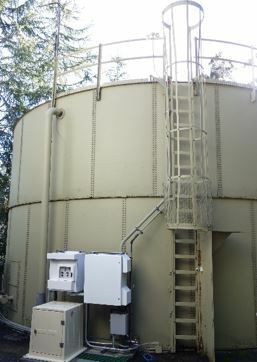 They were using existing and proposed reservoirs situated approximately half a mile from the distribution system that shared a common inlet/outlet line that split to service two tanks. SJWC approached UGSI with the idea that the UGSI active mixing system (Tank Shark®) would provide a greater impact on water quality than a passive mixer and at a significantly lower capital cost than separate inlet/outlet piping. SJWC and UGSI worked together to demonstrate to the CA DDW that an active mixing system would eliminate the need for a dedicated inlet/outlet and request a variance for the design of the new Belgatos reservoirs.